Science Node is a free online publication, developed in collaboration with organizations in the US and Europe. Our team writes for experts and non-experts alike, exploring the real-world impact of advanced computing and networks. Why Science Node? The name emphasizes our connectedness. With every story, Science Node illustrates how science improves our everyday lives. And it serves as an international connection and redistribution point — a point of communication, intersection, and convergence. Advanced computing: High-performance computing (supercomputing), cloud computing, grid computing, novel computing, cluster computing, etc. Community building: Women in tech, diversity and expansion efforts, citizen science, collaborations and partnerships, etc. We're also committed to featuring a wide variety of disciplines, ranging from science and engineering to the arts and humanities. You are welcome to reprint stories from Science Node™ under the condition that you acknowledge Science Node™ and appropriately attribute the author. We also encourage you to link to the Science Node™ website. This work is licensed under the Creative Commons Attribution-Noncommercial 3.0 License. To view a copy of this license, visit http://creativecommons.org/licenses/by-nc/3.0/ or send a letter to Creative Commons, 171 Second Street, Suite 300, San Francisco, California, 94105, and USA. The US National Science Foundation supported sustaining and strengthening iSGTW (award 1242759), including the initial transition to Science Node. In Europe, iSGTW received funding from CERN and the European Commission. 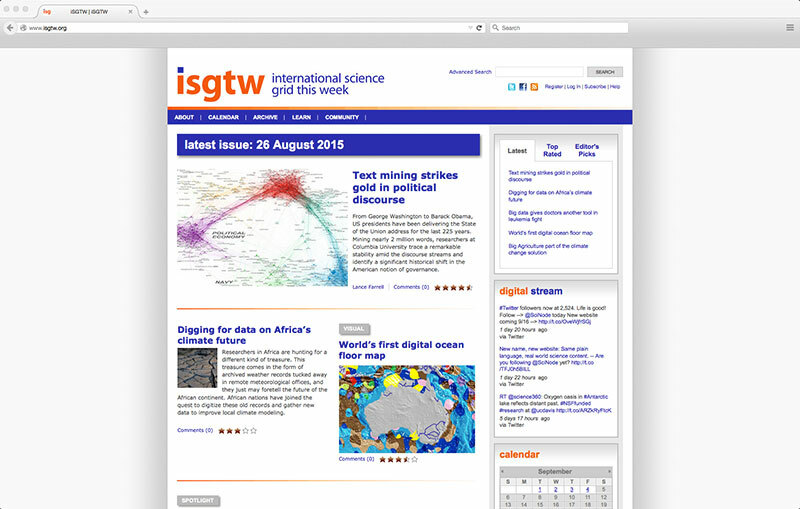 iSGTW also received in-kind support from the Open Science Grid.